NAEGA Board of Directors Chairman and Columbia Grain President & CEO Thomas J. Hammond passed away from a sudden illness at the age of 60 on Thursday, February 14, 2013. Tom became a member of the Board on December 6, 2001. He became a Vice Chairman in 2007 and was elected Chairman of the Board on February 22, 2012. A graduate of Vanderbilt University, Tom started working in the grain industry right out of college, moving to Iowa to work for Cook Industries. He was soon transferred to Portland, Oregon and when Cook sold its grain division to Marubeni Corporation in 1978, he stayed on as it became Columbia Grain, becoming the Company’s President & CEO in 2000. 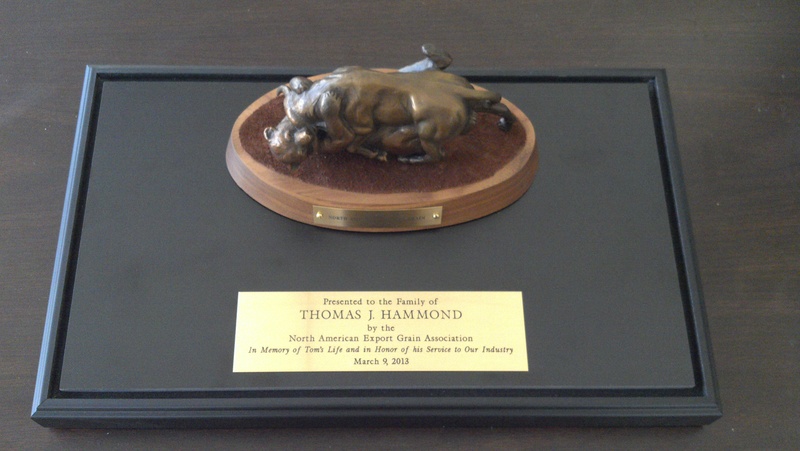 Tom is survived by his wife of 33 years, Cheryl Hammond; his son, Robert Hammond; and his daughter, Katherine Hammond. Members of the International Grain Trade Coalition were shocked to hear of Tom’s tragic death earlier this month while we were in Washington attending meetings. We have often heard from Gary Martin of Tom’s significant contribution to our industry and his leadership within the North American Export Grain Association as a Member of the Board and more recently, as Chairman. Many of us were fortunate to spend time with Tom last year when we were in Washington to celebrate NAEGA’s 100th Anniversary. We are sorry that we cannot be you to celebrate Tom’s life on 9th March but Members asked that I express to you and your family our deepest sympathies. Our thoughts and prayers are very much with you. I formerly managed the National Grain and Feed Association and in that role had many opportunities to interact with Tom and see his contributions to the grain industry and its organizations. Tom served on the NGFA Board and he worked with me on the financial investments committee for several years. Tom was a person with vision for his own company and the industry at large. In his work for NGFA, he always understood that his service on the industry boards and committees was all about giving advice on actions and policies for the broad benefit and acted accordingly. He certainly managed his company well, but he helped manage the industry affairs quite well too. And most importantly, when Tom said he would do something, I was never disappointed in the outcome. He always accomplished what he said he would do. He was a committed individual. I wish you and your family the very best going forward, and I offer my prayers. Tom will be missed by many in the grain business. Over the years, US wheat producers have had no better partner in the grain export industry than Tom Hammond -- with whom we have worked to expand US wheat exports to the broad benefit of the entire wheat industry chain. No doubt beginning with origins from his own personal and corporate self-interests in recognizing that the work eventually was directly tied to bottom-line benefits, Tom was a rock-solid partner for U.S. Wheat Associates in devoting not only his own personal time, but encouraging the same from his staff and dedicating the resources of the company to partner with USW on scores of market development activities abroad and in the US. Many of USW's foreign staff have fond recollections of Tom traveling with Paul Dickerson or myself to far off places like Yemen, Egypt, Kenya, Uganda, Costa Rica, Guatemala and countless others all in the pursuit of opening one more door for US wheat exports. Selflessly, Tom devoted CGI's own resources by encouraging his staff - Mike Wong, Ron Williams, Amer Badawi and others - to travel to equally far off places to participate in USW sponsored seminars, conferences and workshops held for foreign wheat importers across Latin America, Asia and the Middle East. To help us provide training for our own staff, on several occasions, Tom allowed one of our newer employees to sit in on CGI's trading room for a week or more just to observe, learn about and appreciate the inner workings of the grain trading and export business. This has helped us to place better qualified and more competent people in the field. And perhaps even putting aside some personal and corporate self-interest, Tom played the honest broker in protecting all party's interests in allowing the discussion for USW to hire then-CGI Chairman, "Charlie" Utsunomiya to become the Director of the Japan office for USW. Tom was always gracious in voicing his disagreements with us over those few USW policies and pursuits that were, in his judgment, perhaps not in the best interests of CGI or the grain export industry, yet he always remained a steadfast supporter and user of USW's resources, programs and activities in the field to partner the entire industry into a more cohesive, effective and profitable environment. Over the past 37 years, Tom has been at various times to me a competitor, a colleague, a sounding board, a balance, a partner, and perhaps most importantly, someone that I considered a close personal friend. He is already sorely missed. 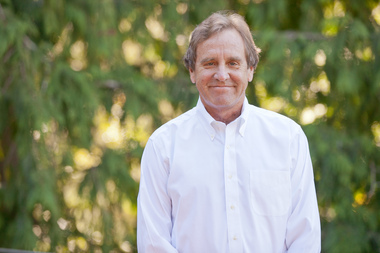 Tom's Family has requested that memorial donations can be made in his name to the Lung Cancer Research and Treatment Program at the Oregon Health & Science University Knight Cancer Institute.